In woodworking: A thin metal blade in a metal or wooden frame. Used for crosscutting and ripping and some curved cuts. 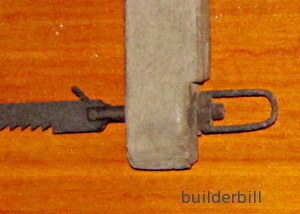 In woodworking: A thin metal blade in a tubular metal frame. 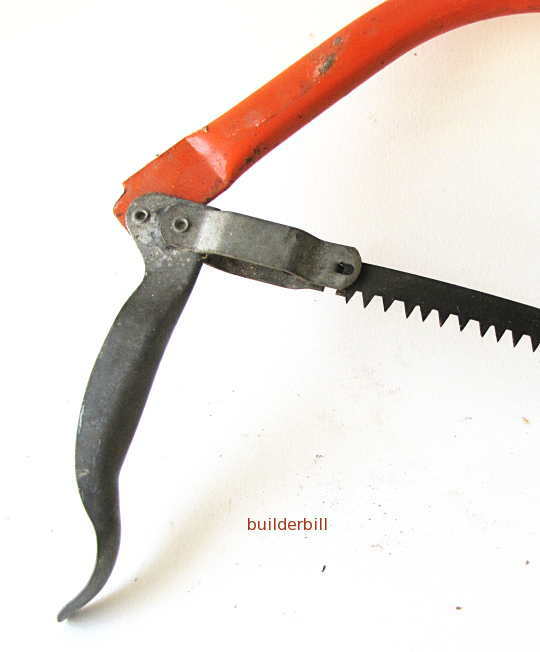 Used for crosscutting, mostly lopping tree branches and sawing up logs. These tools are very simple and in many cases the wooden ones are made by their owners. The only thing to buy is the blade. Like a hacksaw or a coping saw the blade can be rotated to suit the work. At the right is a detail of an old Vietnamese saw. 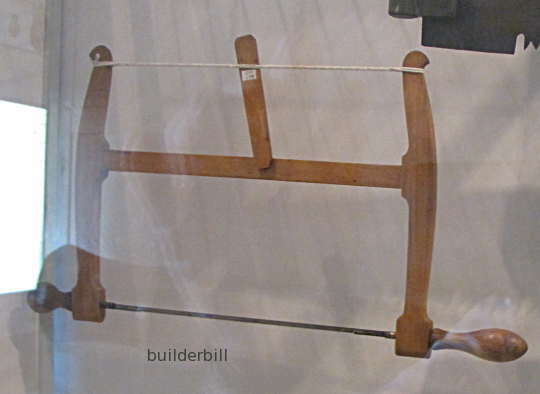 This one has a a timber cross bar at the top in place of the twisted cord above, so in this case the saw maker used a nut and bolt to do the tensioning of the blade. These saws work on the pull stroke only. One last point, taught to me more than 50 years ago but that seems to be totally ignored today. These saws rely on tension to work. A tight blade is a good blade. Never leave the saw for long periods under tension. The frame will adapt to the tension by bending and so the next time it will need more tension, and so on and so on. Above is another type of saw entirely, which also gets called a bow saw. In this case I would say that the American term of Buck Sawis probably more appropriate. These saws are cheap and the blade is thrown away when it becomes dull. They work on the push and the pull stroke, see the detail of the teeth below. Buck saws not rotate the blade sideways. They use a simple, quick and very effective lever system to tension the blade. Buck saws come in two handed sizes also. See here for more on two man saws. Read the point above about leaving them permanent tension. These saws in particular bend over time and become useless. If you buy a good one, take out the blade if you are storing it away.